As a beauty blogger, I’m constantly testing new products on my skin — which is both a blessing and a curse. I’m thankful that, on the one hand, I don’t have very reactive skin, so I can switch up my products a lot without too many repercussions. However, I long for the day when I figure out a stable, beautiful routine that truly works for me. I don’t think I’ll ever have one single routine, though, as my skin’s needs change with the seasons as well as week to week (thanks, hormones! ), but I thought it would be fun to introduce a new monthly (we’ll see…) series documenting my current beauty routine, comprised of old favorites, links to previous reviews and insights into what I’m testing, along with preliminary results and thoughts. I like to use a cream cleanser in the morning, given my skin should be clean and makeup-free if I did my job the night before. Cream cleansers are also important for me during transition weather time, as my typically oily skin can get dry patches, and that extra little bit of creamy moisture starts my skin off right in the morning. 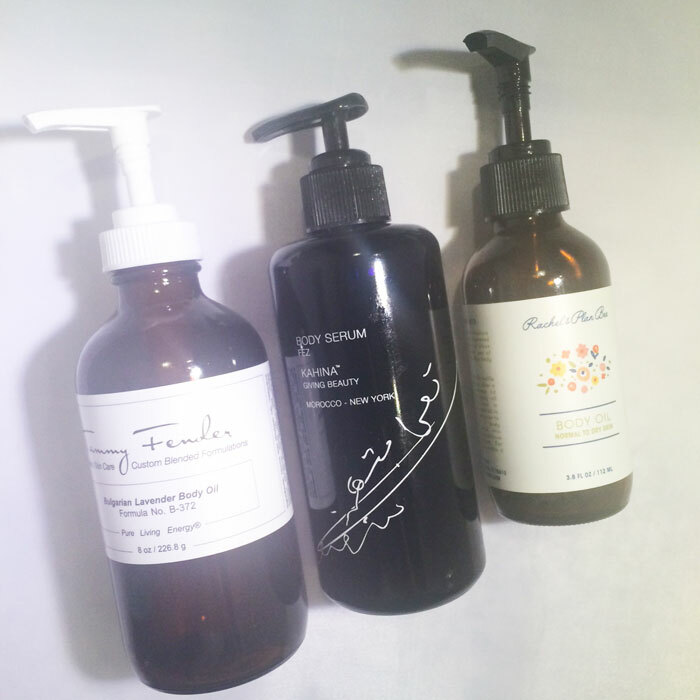 I’m currently finishing up Marula: The Leakey Collection Pure Marula Cleansing Lotion (reviewed here) and will be on to trialing Brittanie’s Thyme Organic Citrus Facial Cleanser going into November. Regardless of which cream cleanser I use in the morning (I’m also a fan of Juice Beauty’s Cream Cleanser, reviewed here), I like to apply them to my face using a konjac sponge, and the current on in my shower is the French green clay one from The Konjac Sponge Company. I’ve been using konjac sponges for quite some time now, but haven’t mentioned them much on the blog. I think they’re lovely in the morning — a nice little gentle exfoliation action combined with a gentle cream cleanser is just a perfect way to ease into the day. The Konjac Sponge Company was the first brand of konjac sponges I tried, but there are lots of great options out there. The key is to find a konjac sponge that feels right against your skin — you don’t want anything too abrasive, and you want one that softens easily. I usually have some sort of soap and body wash in my shower at all times, but right now, I’m relying on two body washes to get me through my morning routine. Some mornings, I reach for Stop The Water While Using Me! All Natural Orange Wild Herbs Shower Gel. I like uplifting scents in the morning — think citrus, mint, coffee — and this one fits the bill. It produces a nice lather without stripping my skin, and I like the gentle reminder to conserve water — cool packaging and brand philosophy! The other body wash currently in my shower is Sunevenus Blue Lotus Body Wash. I will be the first to admit that the packaging on this body wash is kinda wonky. The oversized bottle towers over my other shower goodies, and the mystical colors on the bottle are odd. But. Oh my gosh. This shower gel has me sold! It’s a pretty blue, thanks to blue lotus, and it delivers a delightful tingle that’s very welcome in the early morning. Because I use a loofah to apply my shower gels and, when I’m using them, bar soaps, I don’t always use an additional body exfoliant. But when I need that extra bit of skin sloughing, my shower is decked out with 10 (yes, you read that right) body scrubs. I just finished a tub of Flo + Theo Wild Mint Body Polish (see what I mean about the invigorating scents?!) 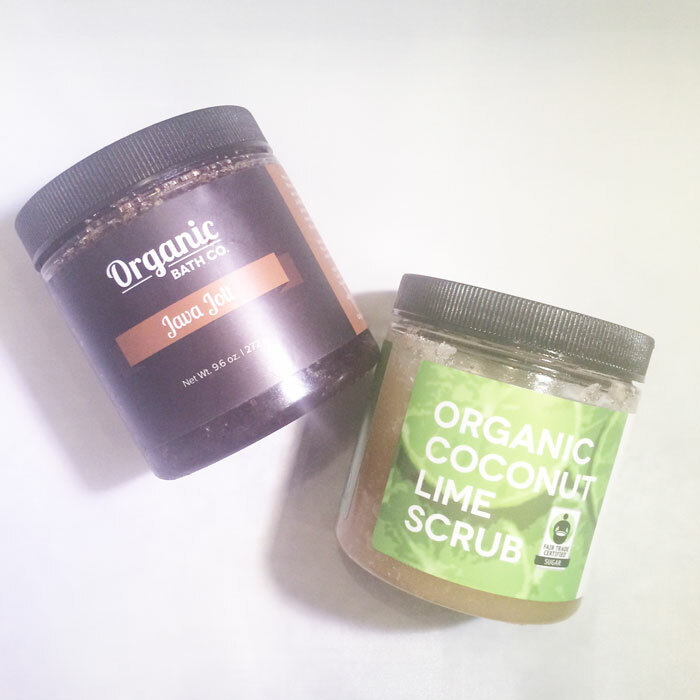 and will be working my way through Organic Bath Co. Java Jolt Organic Sugar & Coffee Scrub and SubLime Organic Body Scrub. If I choose to use a body scrub in the shower, I usually don’t follow up with a body oil, as there’s usually some residual oil on my skin that provides sufficient moisture. But as I don’t use a body scrub every day, it’s imperative to slap on body oil post-shower. I have an expansive body oil collection, and I usually reach for one based on scent and mood, but lately, I’ve been loving three very different body oils. The first one that I’m more than halfway finished with is the new body oil from Rachel’s Plan Bee. If you’re a vanilla fan, you need this in your life. I find it comforting and ultra luscious on the skin. If you tend to wear vanilla or spice fragrances, this is a nice base for them — it won’t compete, but just compliment and help extend the life of your (hopefully natural!) fragrance. If I’m not in the mood for vanilla, I reach for Tammy Fender’s Bulgarian Lavender Body Oil. It’s combination of lavender and rose makes for a stellar scent that’s deep, complex and soothing. This is one to relax to in the evening bath as well — such a versatile and beautiful oil. The other oil that I’ll be mourning the loss of very soon is Kahina Giving Beauty’s Fez Body Serum. I’ve been loving this oil since late summer, and it’s down to the last few pumps. At “A Night for Green Beauty” in LA earlier this year, I sat next to Kahina founder Katharine L’Heureux at brunch and raved to her how I’d been living in Fez — the serum, not the city! I’m about to be homeless, you guys. I ran through this oil like nothing else because of its unique, spicy and cool scent and gorgeous appearance atop my vanity. Though vastly different, these three oils have one thing in common: They are each packaged in convenient pump bottles that makes application easy. Want to be heavy handed? Pump away! Want to control how much oil you use? Pump gently. The bottom line is, you’re in control when there’s a pump bottle applicator. More body oils should be packaged this way. Out of the shower, I like to lightly spritz my face with a multitasking toner that offers both hydration and acne-fighting properties. For me, this is May Lindstrom Skin’s The Jasmine Garden. I just finished another bottle of it (I think this is bottle three or four!) and have been missing its heady jasmine scent and powerful antibacterial properties (see my review here). I also don’t think it’s a coincidence that for the past two weeks without it, my skin has been a bit of a hot mess. I’m re-ordering this once I get my skincare wish list together (gonna have some major hauls for November, as it’s my birthday month!). While my face is still damp with jasmine beautifulness, I pat in Dr. Alkaitis’ Soothing Gel. I had a small travel-sized sample of this several months ago, and before it was almost out, I immediately repurchased the full size because it’s that good for my oily, acne-prone skin. This gel gently tightens, balances and — duh — soothes the skin, bringing it back to its normal levels after a hot shower. It dries quickly, leaving the skin ready for the next layers of skincare goodies. Which leads me to my current daily skin cocktail. 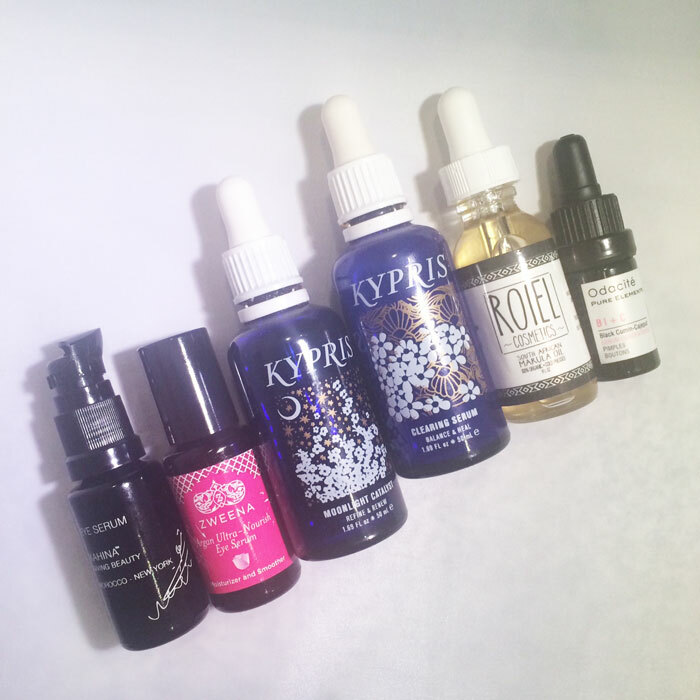 I’ve been loving KYPRIS Beauty’s Antioxidant Dew and Beauty Elixir II Healing Bouquet mixed together with a couple drops of one of Odacite’s skin boosters — Blueberry Jasmine Serum Concentrate on dry mornings, or Peach Cypress Serum Concentrate on regular days. KYPRIS is one of those lines that really “gets it” when it comes to sustainability all around. I love that the line is all about experimentation — mixing up your own special blends — and encourages you to use just a few drops of each precious moisturizer to get your skin glowing. I combine 2-3 drops of Antioxidant Dew with 2-3 drops of Healing Bouquet, which is way less than I usually use with other facial oils, yet it delivers so much more: A lightweight oil and dewy moisturizer that spreads easily across the skin. The addition of 1-2 drops of the Odacite booster of choice ensures I get an additional shot of whatever my skin my need that day. I’ll be moving on from this regimen soon (I have so many other facial oils to test! ), but it’s been one of my favorites by far, and I could see myself becoming a KYPRIS girl for life. Look for standalone reviews of these items very soon! Now that it’s fall transition weather, an eye cream or oil is becoming more and more necessary, including during the day. I prefer to use a creamy formula during the day (instead of an oil), under makeup, and an eye oil at night. For my daytime eye treatment, I pat in half a pump of Kahina Giving Beauty’s Eye Serum under each eye. I like how lightweight it is, and the fact that I bought this from Katharine herself makes me happy to use it every morning. It’s not exactly a cream — more of a gel — but it’s not an oil, either. My coworker Amy seems to have my office beauty routine memorized (“Is it already time to mist your face?”. The only thing I tend to do during the day is mist my face, reapply lip balm and lip color and, sometimes, pat in some facial oil if I’m feeling dry or lackluster. 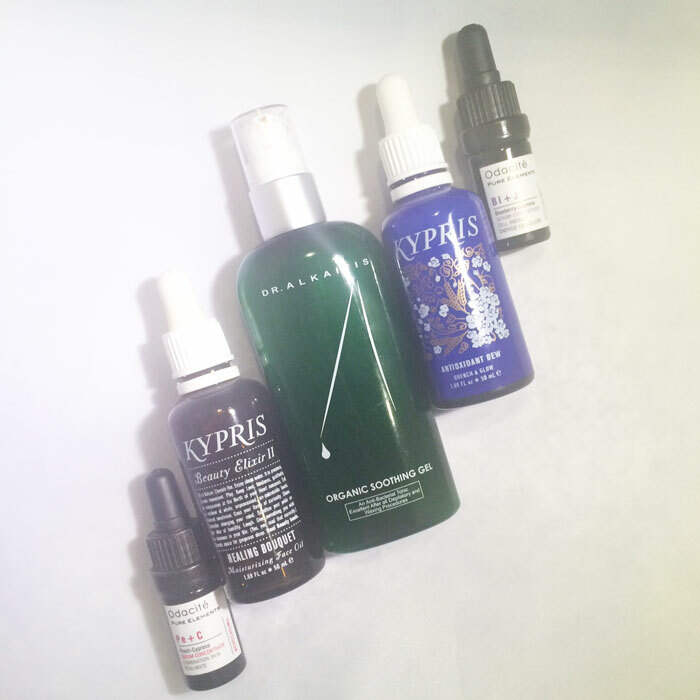 I keep about five hydrating facial mists on my desk, but the one I constantly reach for right now (typically in the early afternoon) is Josh Rosebrook’s Hydrating Accelerator. OMG. It’s got this light, marshmallow scent to it, and the mist is so fine and perfect, it truly is an early afternoon pick-me-up for my skin. My office lip balm of choice (OK, I have five of them on my desk) is Moon Valley Organics’ Herbal Lip Balm in Vanilla. It’s creamy and smooth and just nice to be addicted to. If I pat in additional facial oil during the day, it’s usually just onto my cheeks, and it’s usually Zweena’s Argan Rose Rejuvenating Face Serum (review here). This is just one of those simple and beautiful face oils that isn’t likely to offend my coworkers’ noses (because, c’mon, it’s rose!). At night, it’s all about gently removing makeup and prepping my skin for slumber and repair. While there’s a lot of great oil cleansers on the market, I’m pretty much sold on using a pure plant oil to break down makeup. Coconut oil and jojoba oil are my go-to’s, but I have tested some very lovely oil cleansers over the past month or so. One that sticks out to me is Province Apothecary’s Moisturizing Cleanser + Makeup Remover. I ran through my sample of this cleansing oil quite quickly thanks to its beautiful combination of sunflower, jojoba, avocado and evening primrose oils that offered great slip and superb strength against even the stubbornest of makeup. Another makeup remover that makes a little more sense for travel (compared to packing along a bottle of jojoba or coconut oils) is Me & The Girls Bar Beleza Multi-Use Beauty Bar. It truly is a multi-purpose beauty bar (think makeup remover, lip balm and moisturizing balm all in one), but I choose to use it as my travel makeup remover because I do just drag this bar across my makeup’d face and get to massaging. After removing my makeup via oil cleansing, I then double cleanse with a nice gel cleanser and my Clarisonic Mia 2. 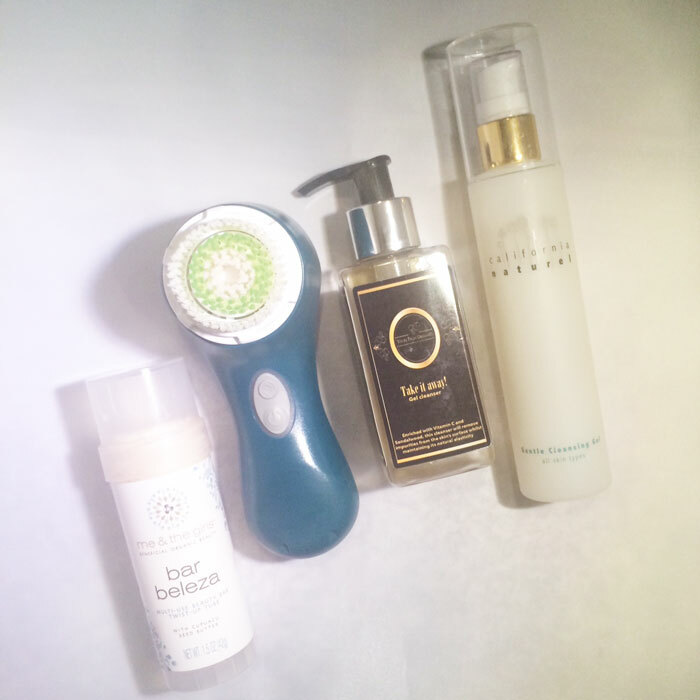 I never used to be a Clarisonic girl, and I’m not saying I live and breathe by the thing, but I use it maybe three times a week or after heavy makeup days to really get my skin clean. 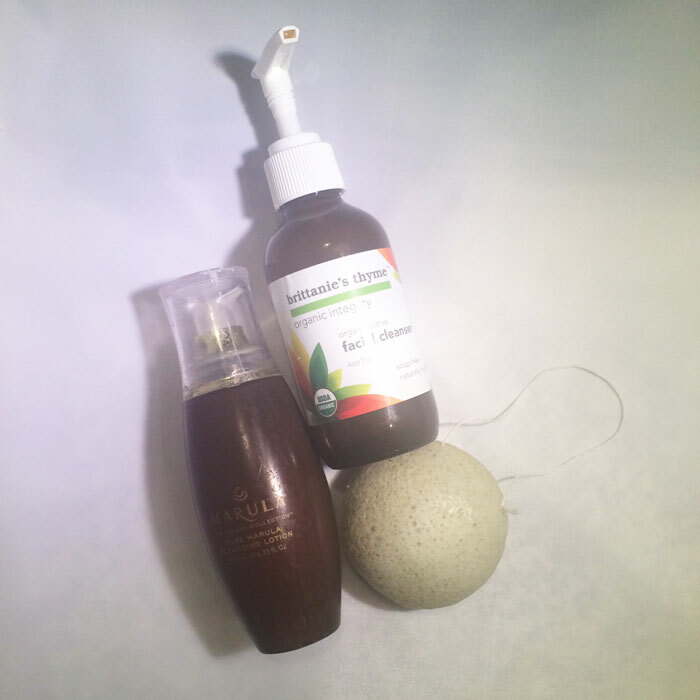 When I’m using the Clarisonic (with the acne brush head), I couple it with Yours Truly Organics Take It Away! Gel Cleanser. This is the best gel cleanser to use with the Clarisonic because it’s extra thick and provides a nice layer of product between your skin and the gentle brush head. It’s not one I like to use on its own, as the thickness of the gel is a bit cumbersome applied with just hands — but with a skin brush? Perfection. I’m down to the last few pumps of this cleanser and will need to find an American stockist for it stat! Once these last few pumps are done, I’ll move over to using my California Naturel Gentle Cleansing Gel with the Clarisonic. It works OK with the skin brush, but I feel like I have to use extra product to ensure there’s a good buffer of gel between my skin and the brush. This is one of those gel cleansers, though, that has enough slip to it to use when I’m washing my face with just my hands. See, every product has its place! After cleansing, it’s time to tone again. Like I mentioned before, I’m out of my beloved May Lindstrom Skin The Jasmine Garden, so I’ve been subbing in a DIY tonic made at my hometown spa that contains witch hazel, apple cider vinegar, tea tree oil, turmeric oil and pine oil. It was also supposed to have aloe vera in it, but my facialist left it out — so I actually added it back in by mixing in some Dr. Alkaitis’ Organic Herbal Toner (because I wasn’t really using it as-is anyway). I like this as my evening toner because, well, to be honest the scent of ACV isn’t quite what I like first thing out of the shower. Plus, as I’m looking for acne prevention and repair at night, I know that my skin responds well to witch hazel. I don’t see this tonic replacing my MLS mist by any means, but for now, it will do. 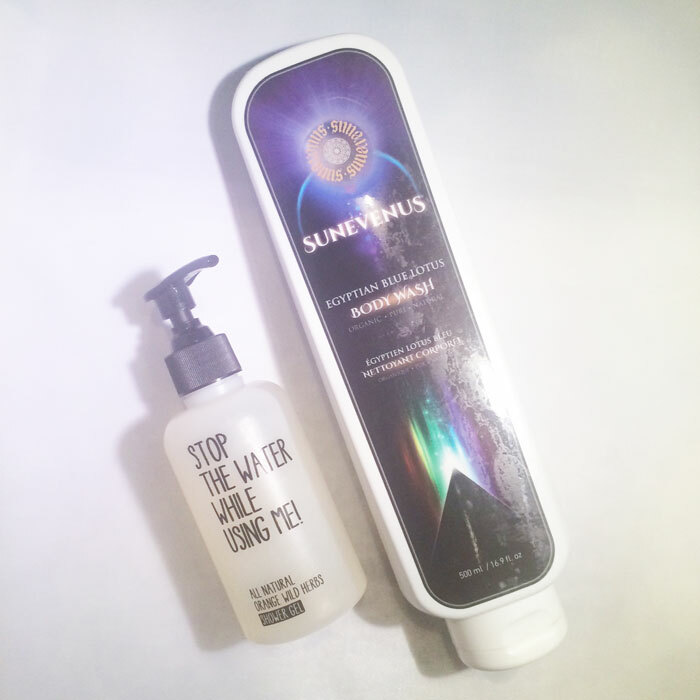 I follow my toner with Dr. Alkaitis Soothing Gel (I just love that stuff!) and then create my evening skin cocktail. Enter KYPRIS once again. This time, it’s a combination of Moonlight Catalyst and Clearing Serum with a shot of Odacite’s Black Cumin + Cajeput serum booster. Sometimes I like to add in a few drops of an additional oil, but because there’s some competing scents from the Clearing Serum and Black Cumin + Cajeput booster, I keep it simple with unscented Roiel Cosmetics Marula Oil. I think it’s so important to keep a very simple and beautiful oil stocked as well as an unscented, minimal, single carrier oil stocked for times like these when you want to play alchemist and do a little mixing. This is becoming more and more the norm for me, and as much as I love my wildly scented blends, it’s nice too have a streamlined oil that can do the trick without too many bells and whistles. After my skincare cocktail has fully absorbed, if it’s extra cool or a bit dry, I’ll dab in a dime-sized dollop of Le Beurre Shop Ultra Rich Shea Butter Face Cream, mainly to my cheeks and nostril area, which tend to get dry patches. I’ll also pat it into my decolletage area and rub any excess all over my hands and arms. This is a relatively scentless shea butter mix (cut with grapeseed, jojoba and vitamin E) that doesn’t clog my pores and is just thick enough for fall and winter. In the spring and summer, this gets very little use! My eyes get a bit of Kahina Giving Beauty Eye Serum again, or, depending on my mood, my Zweena Argan Ultra-Nourish Eye Serum (review here). If my hands still feel like they need a bit of moisture, I’ll add give them a shot of my favorite hand cream before getting into bed, and I’ll also reapply that niche lip balm. I don’t usually re-moisturize the other parts of my body before bed, but that may change as it gets colder here in the Midwest. So, OK, I’ve mentioned more than 30 products here (hi Laurel, here’s a 30+ product girl!). And you know what? I use them and love them all, and this isn’t even all of them that get touched regularly. These are just the ones that have been in rotation recently, and as we go into a new month and a new round of product testing, this will shift. I’ll check in with you again at the end of the month to detail what I’ve been using, and hopefully you will see some in-depth reviews of the products I mentioned here very soon! And, I’m for real here, I do look forward to the day when I can document my streamlined routine of things that I love and work well for me. Switching products all the time can be rough on the skin and the psyche, and as a blogger, for me to tell you these detailed things makes me feel like I’m having to choose favorites among children. I love green beauty brands and everything they stand for, and I hope to continue uncovering the best ones that work for me! What products stood out to you in my routine? Which ones would you like to see in-depth, detailed reviews of first? Which ones do you also use? Tell me in the comments section!